Frederick L. “Fred” Groennert, 73, of Trenton, died Tuesday, October 06, 2009 at Barnes-Jewish Hospital in St. Louis, MO. Mr. Groennert was born January 9, 1936 in Nashville, IL to Frederick H. and Clara (McMurdie) Groennert; they preceded him in death. Also preceded in death by a sister, Lillian Groennert; father-in-law and mother-in-law, Nick and Emily (Winka) Borowiak; and brothers-in-law, Dr. Charles Thorpe, DVM and Edward Jankowski. He married Patricia Borowiak on May 12, 1962 in Springfield, IL; she survives in Trenton. Also surviving are his children, Leanne (Steve) McDonald, John (Lisa) Groennert, and Tricia (Cory) Williamson all of Trenton; 5 Grandchildren, Brooke McDonald, Justin and Jordan Groennert, Mara and Cade Williamson; a sister, Frances Thorpe of New Baden; brothers-in-law and sisters-in-law, Martin (Leona) Borowiak of St. Louis, Nick (Jane) Borowiak of Venedy, Mariann Jankowski of Okawville, Jeanne (Ray) Knopik of Swansea, and Richard (Gail) Borowiak of Nashville; a niece, Dr. Charissa (Dr. Robert Klinsky, O.D.) Thorpe, O.D. of New Baden; great-nieces, Claire and Whitney Thorpe-Klinsky; and his beloved dog, Cayenne. Fred graduated from Illinois Wesleyan with a B.S. of Arts, retired as the chief of graphics at Scott Air Force Base, and was a Veteran on the United States Air Force Reserves. He was a member of Zion United Church of Christ in New Baden, and was an avid painter and sports fan, enjoying hunting, fishing, basketball, baseball (especially Wesclin High School), or any other activity his grandchildren were involved in. 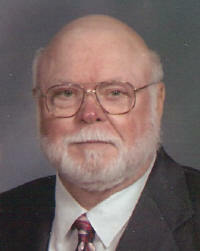 Funeral Services will be Saturday, October 10, 2009 at 10:00 AM at Zion United Church of Christ in New Baden with Rev. Gretchen Sterrett officiating. Interment will follow in Greenmount Cemetery, New Baden. Visitation will be Friday, October 9, 2009 from 4:00-8:00 PM and again on Saturday, October 10, 2009 from 8:00-9:30 AM at the Moss Funeral Home in Trenton. Memorials can be made to the Zion United Church of Christ Memorial Fund or to the Trenton Park Boosters and will be received at the funeral home.